Background: The impact an article has on a specific field is manifested by its number of citations. The aim of this systematic review was to perform a citation analysis and identify the 100 most-cited articles in the field of minimally invasive (MI) gastrointestinal (GI) surgery. Methods: The Institute for Scientific Information Web of Knowledge (1945–2017) was utilised to identify the top 100 most-cited articles in the field of MI GI surgery, using 19 distinct keywords. The data extracted were number of citations, time of publication, research topic, level of evidence, authorship and country of origin. Results: Of the 100 most-cited articles, the number of citations ranged from 3331 to 317 citations. Most publications reported on bariatric surgery (n = 36), followed by oncology (n = 26) and hepatobiliary surgery (n = 15). The studies were published in 26 different journals with the top three journals being Annals of Surgery (n = 30), New England Journal of Medicine (n = 10) and Obesity Surgery (n = 9). The studies were conducted in 17 different countries led by the USA (n = 51), the UK (n = 9) and France (n = 6). Articles were published on all levels of evidence: level I (n = 20), Level II (n = 29), Level III (n = 8), Level IV (n = 29) and Level V (n = 14). Conclusion: The study revealed citation classics in the field of MI surgery. Interestingly, a high level of evidence was not significantly associated with an increased citation number. Introduction: Diaphragm pacing stimulation (DPS) is a treatment method used in respiratory failure occurs in diseases such as high-level cervical spinal cord injury, central hypoventilation syndrome and amyotrophic lateral sclerosis. Materials and Methods: A total of 43 patients, who had undergone DPS implantation surgery were evaluated retrospectively. The patients were divided into two groups according to the surgical technique (Group 1: classical surgical technic and Group 2: modified surgical technic) applied. The patients with previous abdominal surgery or percutaneous endoscopic gastrostomy were excluded from the study. Results: The mean operation duration was significantly shorter in modified DPS implantation technic (105.1 min in Group 1 and 87.4 min in Group 2) (P < 0.001). Capnothorax is seen 11% of the cases in classical surgery procedure. In the modified group, capnothorax was not observed. Pneumothorax rate was found similar in both groups. Post-operative atelectasis was determined 16% of the cases in classical surgery procedure and also in the modified group atelectasis was not observed. The complications were higher in classical surgery procedure group but not differed statistically in this study. Total hospitalisation duration was significantly shorter in the modified surgical technique group compared to the other group (8.0 days in Group 1 and 6.0 days in Group 2) (P = 0.03). Conclusion: With modification in DPS implantation surgery, shorter operation and hospitalisation durations, and less complications may be achieved. 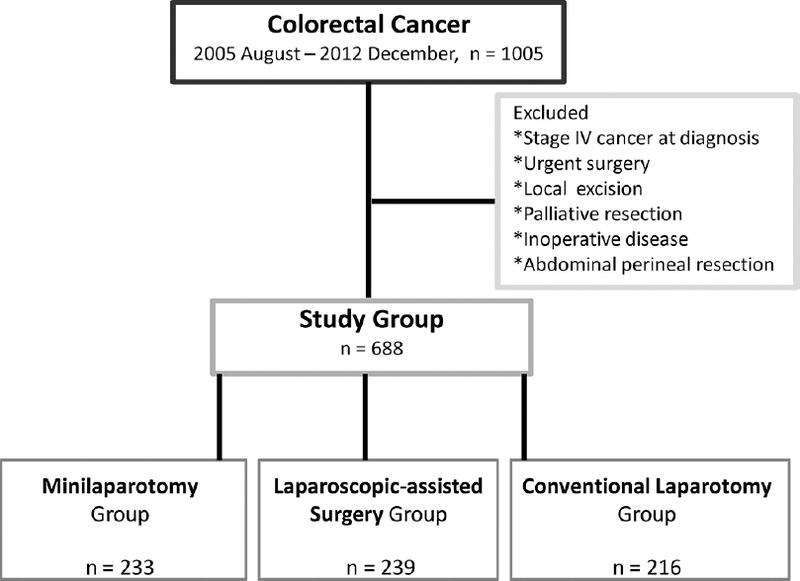 Background: Although the number of reports on laparoscopic hepatic resection (LHR) has increased, studies of long-term outcomes regarding tumor recurrence and patient survival compared to the conventional open approach are limited. We evaluated the long-term survival and feasibility of LHR in patients with hepatocellular carcinoma (HCC). Patients and Methods: A retrospective analysis was performed on the clinical data of patients who underwent hepatic resection for primary HCC between August 2000 and December 2013. The patients were divided into the LHR or open hepatic resection (OHR) groups. To control for selection bias in the two groups, propensity score matching was used at a 1:1 ratio based on the following covariates: Child–Pugh grade, tumour size, tumour number and tumour location. Following propensity score matching, thirty patients were included in the LHR group and thirty were included in the OHR group. Results: The respective disease-free survival rates at 1 year, 3 years and 5 years were 78.4%, 61.1% and 38.9%, respectively, for the LHR group, and 89.3%, 57.5% and 47.9%, respectively, for the OHR group (P = 0.89). Also, the overall survival rates at 1 year, 3 years and 5 years were 96.4%, 68.2% and 62.5%, respectively, for the LHR group and 100.0%, 95.8% and 72.3%, respectively, for the OHR group (P = 0.44). Conclusions: According to our study, using propensity score matching, LHR for HCC is safe, feasible and comparative, with good oncologic results. Background: Obesity is a risk factor for deep vein thrombosis (DVT) and venous thromboembolism (VTE). VTE is the most common cause of mortality in patients undergoing bariatric surgery. There is considerable variation in practice regarding methods, dosages and duration of prophylaxis in this patient population. Most of the literature is based on Western patients and specific guidelines for Asians do not exist. Methods: We conducted a web-based survey amongst 11 surgeons from high-volume centres in Asia regarding their DVT prophylaxis measures in patients undergoing bariatric surgery. We collected and analysed the data. Results: The reported incidence of DVT and VTE ranged from 0% to 0.2%. Most surgeons (63.64%) preferred to use both mechanical and chemoprophylaxis with low-molecular-weight heparin being the most preferred form of chemoprophylaxis (81.82%). There was an equal distribution of weight-based, body mass index-based and fixed-dose regimens. Duration of chemoprophylaxis ranged from 3–5 days after surgery to 2 weeks after surgery. For high-risk patients, 60% surgeons preferred to start chemoprophylaxis at least 1 week before surgery. Routine use of inferior vena cava filters in high-risk patients was not preferred with some surgeons adopting a selective use (36.36%). Conclusion: The purpose of this survey was to understand the trends in DVT prophylaxis amongst different high-volume bariatric centres in Asia and to relate the same with the existing literature on the different steps in prophylaxis. There is, however, a need for consensus guidelines for DVT prophylaxis in Asian obese. Introduction: The fear of pleural adhesions and densely stuck lymph nodes in India, a country where tuberculosis is endemic, is one major factor keeping our surgeons away from video-assisted thoracoscopic surgery (VATS) lobectomy. In this paper, we aim to report our experience with performing VATS lobectomy in 102 cases using a standardised three-port anterior approach. Materials and Methods: Between March 2012 and September 2016, we performed 102 VATS lobectomies. Sixty patients (58.8%) were males and 42 females (41.2%), with a mean age of 42.02 years. Diagnoses were as follows: benign disease (72), lung cancer (27) and pulmonary metastases (3). Among the cases with primary lung cancer, twenty out of 27 (74%) were adenocarcinoma and 7 cases of squamous carcinoma (25.92%). All patients underwent lobectomy by a standardised three-port anterior approach. Results: The overall conversion rate was 8.82% (n = 9). We observed no postoperative complications in 82 (80.4%) patients. The average blood loss was 211.37 ml. Mean operative time was 173 min. Median length of hospital stay was 5 with median chest tube duration of 4.9 days. There was no in hospital or 30-day mortality. The most common complication was prolonged air leak. Conclusion: From this first Indian series, it is clear that VATS lobectomy is feasible in both benign and malignant cases. It also shows that the fear of adhesions is unwarranted and properly selected benign cases can also undergo VATS lobectomy safely. Introduction: Open radical cystectomy (ORC) has been the standard treatment for muscle-invasive bladder cancer, but this is associated with significant morbidity and mortality. Robot-assisted radical cystectomy (RARC) has been proposed as minimally invasive alternative with improved morbidity and acceptable oncological outcomes, but a large series featuring RARC and their comparison with ORC is still lacking in India despite more than a decade of its inception. We have conducted this study with an objective to see the feasibility of RARC in the Indian context and compare it with contemporary standard. Methods: This is a prospective cohort study conducted at two tertiary cancer institutes. We have evaluated the patients pertaining to operative and early post-operative factors from January 2014 to December 2015. 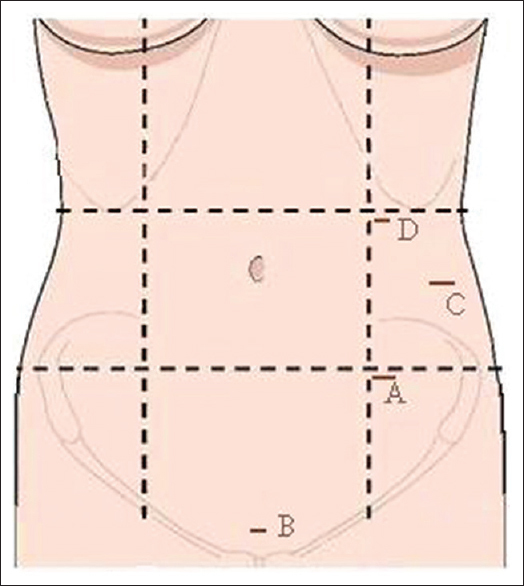 Necessary statistical tests applied to see comparability of the arms and their outcomes. Results: A total of 170 patients underwent surgery for carcinoma bladder (45 ORC while 125 RARC). Intraoperative blood loss (RARC and ORC: 228 and 529 ml) and average transfusion rate were lower with RARC. A trend towards benefit was noted in favour of robotic arm in terms of mean complication rate (RARC and ORC: 54 and 39%). Conclusions: The present study has shown comparable surgical and early post-operative outcomes with clear advantage of robotic approach in terms of intraoperative blood transfusion and lymph node yield. Although the study was non-randomised in nature, it should provide substantial evidence on safety and feasibility of RARC in the Indian context and a reference point of evidence to look ahead. Introduction: Laparoscopic ventral mesh rectopexy (LVMR) has gained widespread acceptance for the management of complete rectal prolapse (CRP). However, there have been concerns considering its use in patients with a redundant sigmoid colon. This study was conducted to evaluate the anatomical and functional results following LVMR, particularly in cases of CRP with a redundant sigmoid colon. Materials and Methods: Retrospective analysis of 25 patients who underwent LVMR from January 2011 to September 2016 was performed. Patients were divided into two groups according to the duration of follow-up. Group A (long-term) with follow-up >3 years and Group B (mid-term) <3 years. Results: The study included 25 patients (M:F = 1.5:1) with a median age of 38 years. Eighty-eight percent of the patients had a redundant sigmoid colon. Significant improvement in post-operative Wexner score as compared to pre-operative values was seen in patients with pre-existing constipation (P < 0.0001). In patients presenting with faecal incontinence (FI), significant improvement in post-operative St. Mark's incontinence score was observed. Functional outcomes remain consistent in long-term follow-up (>3 years). Conclusions: LVMR seems to be a feasible surgical procedure with minimum morbidity and good long-term functional outcomes. It provides satisfactory results in patients with redundant sigmoid colon and improves pre-existing constipation and FI. Background: Single-port laparoscopic cholecystectomy (SPLC) is a new advanced technique in laparoscopic surgery which has many benefits according to previous reports. The purpose of this study was to present personal experiences with SPLC in >800 cases performed by a surgeon to evaluate the safety and feasibility of this procedure. Materials and Methods: A retrospective review of 817 cases of SPLC was conducted. All patients had received elective SPLC by a surgeon in our centre during March 2009–August 2015. Our review suggests patients’ character, peri-operative data and post-operative outcome. Results: Three hundred and ninety-eight men (48.7%) and 419 women (51.3%) with an average age of 48.3 years had received SPLC. Their mean body mass index (BMI) was 23.75 kg/m2. The mean operating time took 46.9 min (19–130). Seventy-nine cases (9.7%) needed additional port during operation. 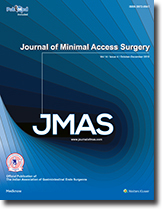 BMI, age and previous abdominal surgical history did not affect conversion to multiport surgery. Bile spillage during operation occurred in 73 cases (8.9%). There were 4 cases of open conversion because of bleeding (2 cases, 0.2%) and common bile duct (CBD) injury (2 cases, 0.2%). Mean duration of hospital stay was 2.36 days. We have experienced 38 cases (4.7%) of post-operative complication: 8 cases (1.0%) of major one and 30 cases (3.7%) of minor one. Major complication occurred in 3 cases (0.4%) of retained CBD stone, 3 cases (0.4%) of cystic duct leakage needed endoscopic retrograde cholangiopancreatography and 2 cases (0.2%) of CBD injury needed reoperation. Most minor complications were wound infections that have healed after conservative treatment. There were no post-operative mortalities. Conclusion: SPLC is a safe and practicable technique. With surgical experience, criteria and area of SPLC can be broadened. SPLC is occupying a greater domain of a laparoscopic cholecystectomy. Background: Natural orifice transluminal endoscopic surgery (NOTES) emerged as a new alternative method in minimally invasive techniques. Although a very small number of studies have compared the physiologic response in NOTES to laparoscopy, the results remain controversial. Aim: This experimental animal study aims to evaluate the intraoperative cardiovascular and respiratory effects of pure transluminal natural orifice surgery and conventional laparoscopy. Materials and Methods: Twenty female pigs (Sus scrofa domesticus) equally divided into two study groups were assigned to either pure natural orifice transluminal endoscopic techniques (Group 1) or conventional laparoscopic surgery (Group 2) and monitored intraoperatively in terms of heart rate (HR), systolic blood pressure (SBP) and O2saturation (SpO2) for 1 h. Both groups underwent simple surgical procedures such as gastrojejunostomy, oophorectomy and adnexectomy. Results: All procedures were successfully completed. The findings indicated statistically significant differences between SBP (P = 0.0065) and SpO2(P = 0.027) in the two groups at the beginning of the interventions. HR showed significant differences during the last 20 min of the interventions (min 40 and 45; P < 0.001). For the whole procedure (from the beginning of the intervention to 60 min interval), HR, SBP and SpO2values showed no statistical difference. Conclusions: Although significant differences in terms of HR, mean blood pressure and SpO2were noted at specific intervals during surgery, no real variance of the cardiovascular parameters was observed when considering the entire procedure. Therefore, NOTES seems to be a safe approach with minimally intraoperative cardiovascular and respiratory implications. Background: Three operative techniques have been used for colorectal cancer (CRC) resection: Conventional laparotomy (CL) and the mini-invasive techniques (MITs)– laparoscopic-assisted surgery (LAS) and mini-laparotomy (ML). 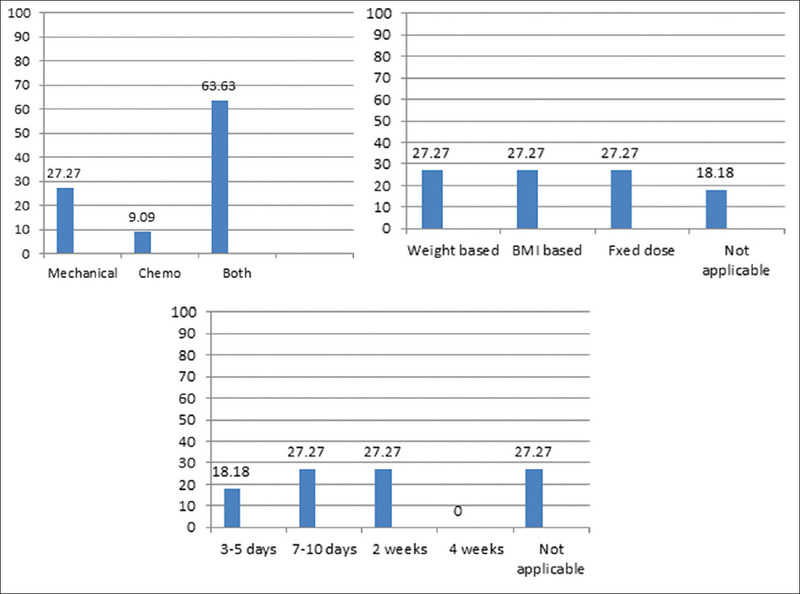 The aim of the study was to compare the short- and long-term outcomes of patients undergoing the three surgical approaches for Stage I–III CRC resection. Patients and Methods: This study enrolled 688 patients with Stage I–III CRC undergoing curative resection. The primary endpoints were perioperative quality and outcomes. The secondary endpoints were oncological outcomes including disease-free survival (DFS), overall survival (OS) and local recurrence (LR). Results: Patients undergoing LAS had significantly less blood loss (P < 0.001), earlier first flatus (P = 0.002) and earlier resumption of normal diet (P = 0.025). Although post-operative complication rates were remarkably higher in patients undergoing CL than in those undergoing MITs (P = 0.002), no difference was observed in the post-operative mortality rate (P = 0.099) or 60-day re-intervention rate (P = 0.062). The quality of operation as assessed by the number of lymph nodes harvested and rates of R0 resection did not differ among the groups (all P > 0.05). During a median follow-up of 5.42 years, no significant difference was observed among the treatment groups in the rates of 3-year late morbidity, 3-year LR, 5-year LR, 5-year OS or 5-year DFS (all P > 0.05). Conclusions: Patients undergoing CL had higher post-operative morbidities. Moreover, the study findings confirm the favourable short-term and comparable long-term outcomes of LAS and ML for curative CRC resection. Therefore, both MITs may be feasible and safe alternatives to CL for Stage I-III CRC resection. 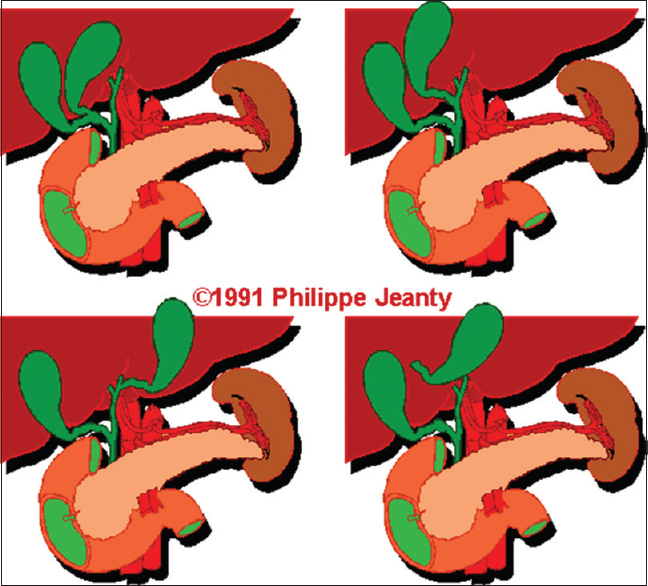 Gall bladder duplication is a rare congenital anomaly. True duplication is still rarer. Pre-operative detection helps in avoiding complications or missing the gall bladder during surgery. Ultrasonography (USG) and magnetic resonance cholangiography are investigation of choice. 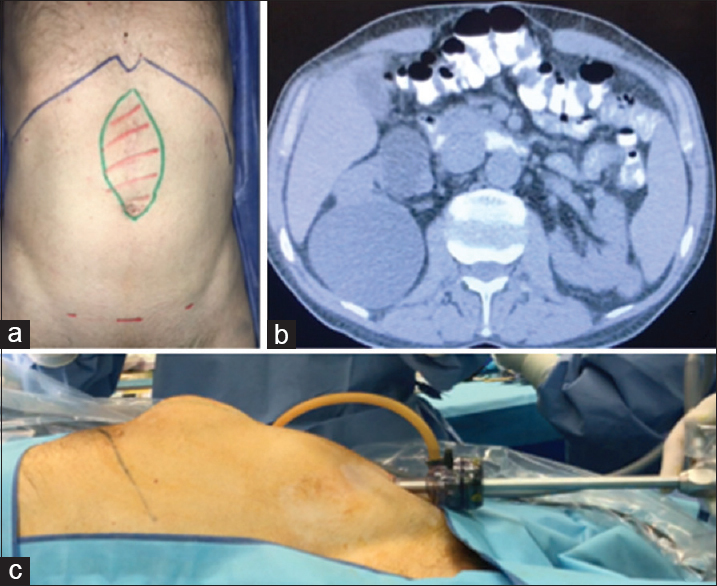 Laparoscopic cholecystectomy is the preferred modality for management of double gall bladder. We present a case diagnosed as cholelithiasis on USG. While doing laparoscopic surgery 2 gall bladders were found. She had a normal gall bladder that was lying in the supraduodenal area. It had cystic duct that joined the common bile duct. There was an accessory gall bladder attached to the anterior free margin of the liver. This gallbladder was occluded with a big solitary calculus occupying the whole of gall bladder cavity and had a small feeding vessel; whereas its duct had fibrosed. 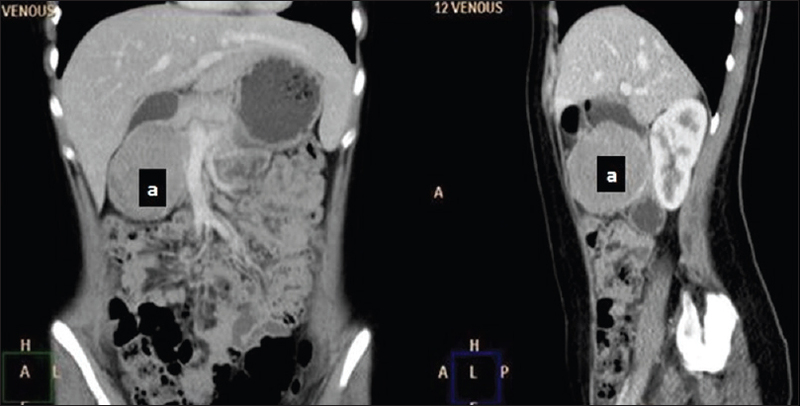 A 67-year-old male with a history of a conventional right colectomy and hypertension was referred to our department for an incisional hernia and abdominal discomfort. Physical examination also showed a supraumbilical defect that was confirmed with a computed tomography scan. Laparoscopic Rives technique repair was done to repair the defect avoiding direct contact of the mesh with the intra-abdominal viscera. The development of bowel-sparing techniques (strictureplasties) for extended stricturing Crohn's disease (CD) and the increased use of minimally invasive surgery (wound sparing) represent the two most important improvements in inflammatory bowel disease surgery from the origin. 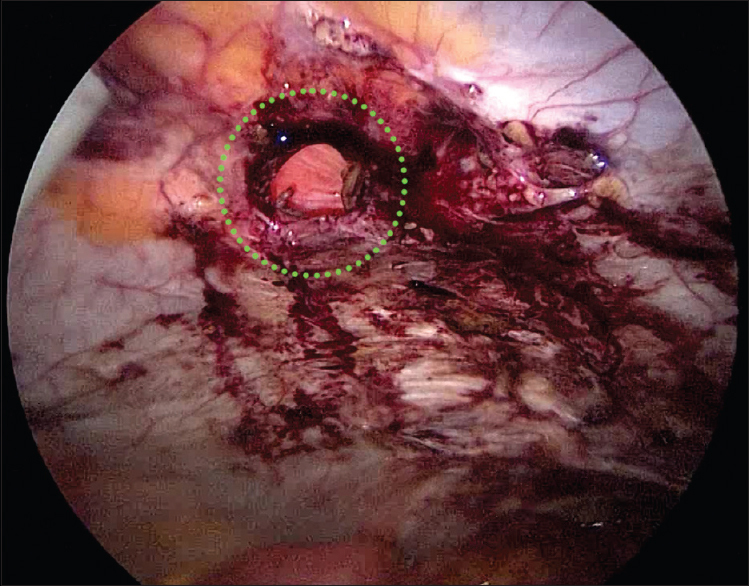 Nevertheless, the minimally invasive approach for extended stricturing forms is usually avoided primarily because of difficulties in performing complex intracorporeal sutures. We describe a totally intracorporeal robotic ileocecal resection with a yet described modified side-to-side isoperistaltic strictureplasty for an extended ileocecal CD. The strictureplasty was 6 cm long including the stricture in its middle part. Adopting this approach, the preserved small bowel was about 10 cm longer. Operative time was about 4 h, with a blood loss of about 50 ml. The patients’ post-operative course was uneventful, enteral nutrition started at post-operative day 2 and gradual oral food intake from day 3. She was discharged on post-operative day 6. Histology confirmed a stricturing CD, and the patient is recurrence free at 34 months’ follow-up. 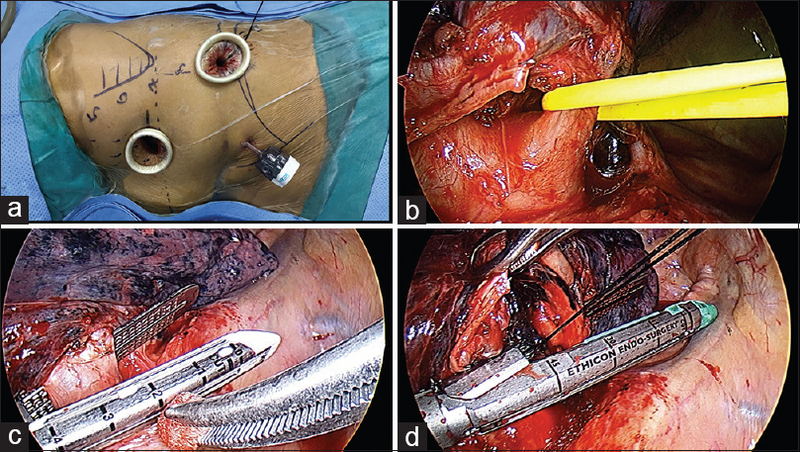 Our report suggests that robotic-assisted intracorporeal strictureplasty is feasible and that robotics could represent an interesting instrument for allowing the intersection between minimally invasive and bowel-sparing surgery for CD. 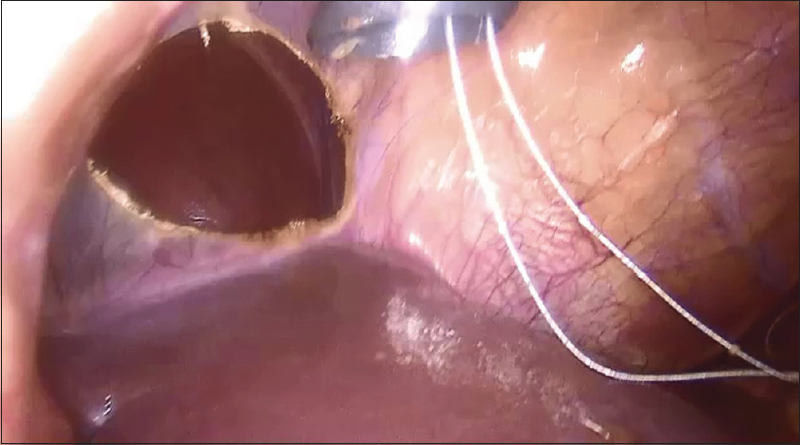 Ventral hernias (VHs) are common in the bariatric population with incidence of around 8% of patients undergoing laparoscopic Roux-en-Y gastric bypass (LRYGB). The factors contributing to the incidence of VH includes high intra-abdominal pressures, previous histories of abdominal surgeries, defects in fascial structure and reduced healing tendency. There is a high index of suspicion in BS patients with VH for hernia complications which can be lethal after LRYGB. Here, we present a case where VH complicated the LRYGB surgery. Solid pseudopapillary tumour (SPT) is one of the uncommon benign cystic neoplasms of pancreas occurring predominantly in young females. Being benign in nature, surgical resection is the treatment of choice with excellent 5-year survival. A 14-year-old girl presented with pain abdomen for 1 week. On evaluation, she was found to have a large SPT involving head and uncinate process of Pancreas She underwent robotic pylorus preserving pancreaticoduodenectomy (R-PPPD) with da Vinci® Si Robotic System (Intuitive Surgical, Sunnyvale, CA, USA). The total operating time was 480 min. Her postoperative recovery was uneventful and she was discharged on postoperative day 6. In the era of minimally invasive surgery, robotic pancreatic resection and reconstruction are becoming more acceptable. Although the operating domain is small in younger age group, the precise movement of robotic arm and high quality magnified three-dimensional view allows the surgeons to perform PPPD on younger patients also. Young female patients suffering from SPTs can electively undergo R-PPPD with minimal morbidity and mortality. R-PPPD can become the treatment of choice for SPTs involving pancreatic head region even in paediatric and adolescent age group. Portal annular pancreas (PAP) is a pancreatic congenital anomaly consisting of pancreatic parenchyma encircling the portal vein and/or the superior mesenteric vein. It has been reported that the risk of developing a post-operative pancreatic fistula is higher following pancreaticoduodenectomy in patients with PAP, probably because of the possibility of leaving undrained a portion of pancreatic parenchyma during the reconstructive phase. 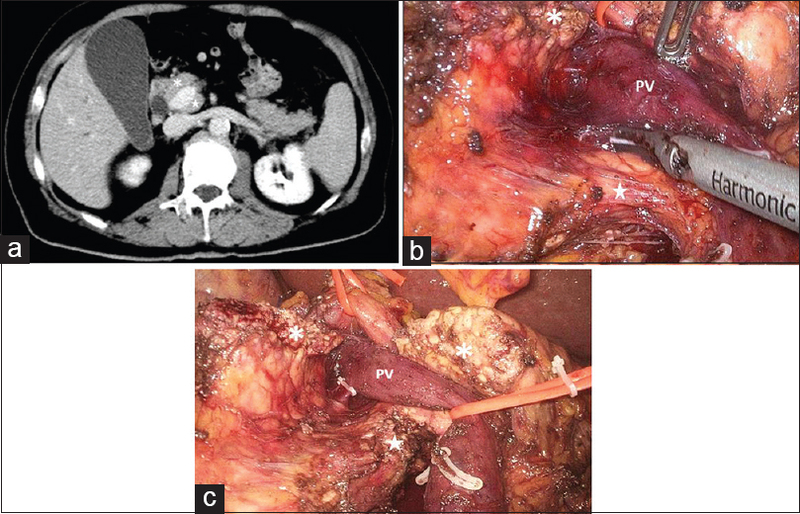 Few manuscripts have reported a surgical technique of pancreaticoduodenectomy in case of PAP, herein we report the first case of a patient with PAP undergoing laparoscopic pancreaticoduodenectomy. Ureteral stricture resulting from chronic inflammations such as tuberculosis, recurrent stone disease and multiple endourological interventions are complex in nature; these may lead to severe adhesions to surrounding structures. Endourological management of these cases is difficult with poorer outcomes. In such situations, reconstructive surgical corrections remain a reliable option. We describe the technique of onlay and inlay buccal mucosal graft ureteroplasty using a robotic platform in management of complex ureteral strictures.